Brody is a beautiful fox red (yellow) with a very mild temperament, he is our house dog and gets along great with other pets and kids. Brody has the perfect on-off switch. Coat Type V BB-ee (Y) carries black and yellow. Does not carry chocolate. Brody received his 3XGMPR and HR titles by 18 month of age and his 4XGMPR by 25 months of age. Brody's training and Handling for his APLA titles was provided by Dale Swiderski of Hunters Rose Kennel. Brody finished second place in his first time entering the Packerland Bird Dog Series against all breeds of pointers in January of 2013. Since our first running Brody was dog of the year 3rd place, 2014 and dog of the year 5th place, 2015. We will be pursuing his MH title and entering in some BDC events as well as running the Packerland series after the hunting season. 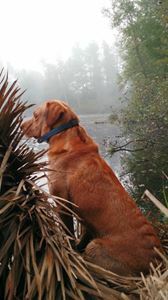 If you are looking for an easily trained lab with high intelligence, superior marking skills and a huge motor in the field with a natural stylish point. Look no further than Brody for your starting foundation.